Minnesota West Ag Services is uniquely suited to help producers better manager their farm revenues through a personalized marketing progam combined with the optimum crop insurance package for each individual situation. Some producers may be working with a marketing advisor or broker, and most producers have crop insurance. However, all too often a producer is working with a marketing service that doesn't understand crop insurance, and at the same time, an insurance agent or agency that doesn't understand marketing. Minnesota West Ag Services brings the two together and will help you take advantage of marketing to maximize your crop insurance. Let MN West Ag Services provide you with a free, no cost, no obligation analysis of your farm to show you how a balanced package of crop insurance and marketing can best work for you. Quoter is an advanced crop insurance program used to provide comparisons on crop insurance rates, insurance plans, coverage levels and their potential indemnity scenarios. In addition Quoter is a powerful tool that uses your crop insurance coverage; costs of production and marketing position illustrate profitability which aids in the marketing decision process. By using Quoter modeling of the insurance plan and market position MNWestAg can help producers to synchronize crop insurance and marketing to maximize the crop insurance. Producers can then make comfortable informed decisions that impact their operations profitability and financial health. You can sell a pre-harvested crop & market your revenue insured bushels with low risk!!! You have price & yield protection on those bushels! Potential for higher returns with less risk! Pre-harvest marketing pays and crop insurance is the tool that allows you to do it with low risk and comfort. Synchronized marketing and crop insurance allows you to make decisions to maximize the benefit from your crop insurance protection. By using Quoter to model the insurance plan and market position MNWestAg can help producers to synchronize crop insurance and marketing to maximize the crop insurance. Producers can then make comfortable informed decisions that impact their operations profitability and financial health. Revenue based crop insurance provides a limit of liability coverage, however a potential for slippage in total revenue exists as a result of local basis. Some producers also mistake the spring base price as the guarantee price of their policy. 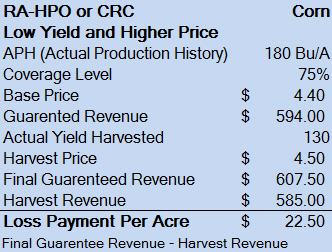 Below is a table that shows the slippage between the liability that a crop revenue policy provides in event of a total crop loss and the potential if you grow a crop equal to your APH but fall prices are equal to the "Effective Guarantee Per bushel." In that scenario your expected guarantee cash price could be significantly lower than the policy liability. Provides protection against physical damage from hail and/or fire. Can be used along with MPCI or other comprehensive coverage to offset the MPCI deductible and provide protection up to the actual cash value of the crop. Coverage is provided on an acre-by-acre basis, so that damage that occurs on only part of a farm may be eligible for payment when the rest of the unit remains unaffected. Can be purchased and/or increased during the growing season. Available for a wide variety of crops, some of which do not have other insurances available. Some crops also have catastrophic loss indemnities and replanting coverage. Pays when damage exceeds the deductible selected on the policy. Losses are paid on an acre-by-acre basis. specific perils.Provides protection for isolated damage. Options with different deductibles may be selected topartially self-insure for reduced premium costs. Pays when damage exceeds the deductible selected on the policy. Production Companion Hail policy details and examples. Comprehensive protection against weather-related causes of yield or production loss and certain other unavoidable perils, including drought, excess moisture, cold and frost, wildlife, disease and insects. Yield Protection protects against low yields, poor quality, replanting costs or prevented planting. The insurance guarantee is based on the producer's own yield records. Minimum catastrophic coverage (CAT) is available and provisions for limited-resource farmers are available. Pays when the actual yield falls below the approved guarantee. MPCI losses are paid at Federal Crop Insurance Corporation (FCIC) determined price. Provides a source of income when low crop yields are caused by covered perils. Adds security to farm loans and low-level security for marketing plans. Guarantees revenue per acre with complete protection against weather-related losses and certain other unavoidable perils, including crop price reductions. Provides protection against low prices, low yields, and poor quality, late planting, replanting costs and prevented planting. Final guarantee set at the higher of the minimum guarantee set at planting (spring price), or the harvest guarantee (fall price). RA without HPO (Harvest Price Option) is available. If RA without HPO is selected, the final revenue guarantee does NOT increase in the event that crop prices increase at harvest. The revenue policies pay when calculated revenue is less than the final revenue guarantee. If RA W/O HPO is selected, the final revenue guarantee does NOT increase in the event that crop prices increase at harvest. A revenue policy insures your profitability, not just your cost of inputs. You can market your crop during the growing season, when prices are usually higher, knowing that you have the revenue guarantee to deliver bushels committed in forward pricing or other market options. You have an established revenue guarantee per acre, and, unlike a pure yield-based crop insurance policy, you may net a higher indemnity payment. CRC and RA W/HPO adds more security to your marketing plan by guaranteeing both upside and downside revenues, with a minimum revenue guarantee. It will help protect your revenue and satisfy your contracts despite low yields. Loss calculations are based on the harvest market price, which provides a bottom-line income guarantee for operating loans. All revenue insurance guarantees are set using Chicago Board of Trade prices. Provides income guarantees for farm loans. Allows you to isolate risk and insure it separately with optional units. You can save on premium by using enterprise units (EU). *The harvest price for RA corn has a different price discovery period and could be different than the harvest price for CRC corn. Protection against widespread loss of production of the insured crop in a county. When an entire county's crop yield is low, most farmers in that county will also have low crop yields. The expected county yield is calculated annually, using years of data from the National Agricultural Statistics Service (NASS). 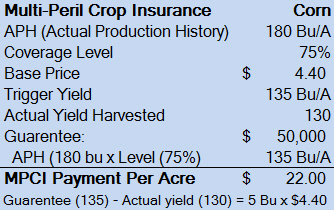 Producers select a coverage level and a dollar amount of insurance per acre. You may be eligible for a loss payment, if the average county yield falls below the selected trigger yield. Your individual yield could be higher or lower than the average county yield; your yield does not directly determine whether you collect an indemnity payment. 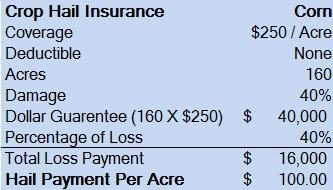 Flexibility-you may select maximum dollar coverage per acre as set by FCIC annually. Indemnity payments are calculated several months after harvest. 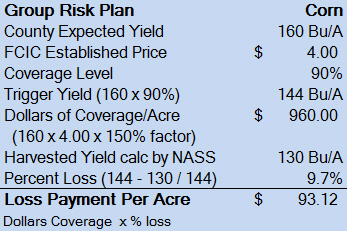 GRP pays when the NASS-calculated County yield falls below the "trigger yield." Less paperwork: simplifies risk management because you only need to provide the number of acres planted by the acreage reporting date. Production history or evidence of loss is not required because loss payments are based on the countyaverage yield. Protection against widespread loss of revenues from the insured crop in a county due to low prices or low yields. In most situations, when an entire county's crop revenues are low, most farmers in that county will also have reduced revenues. The indemnity loss is strictly based on the county revenue falling below the trigger revenue. It does not matter if your individual farm has a revenue loss or not. Allows flexibility as you can choose within a range of maximum dollar coverage based on Chicago Board of Trade (CBOT) prices. GRIP without the harvest price option (HRO) is available. 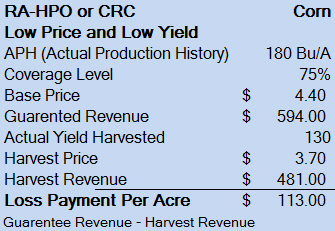 If GRIP without HRO is selected, the final revenue guarantee does NOT increase at harvest. Indemnity payments are made about five months after harvest. GRIP pays when the NASS-calculated county revenues fall below the "trigger revenue" for the covered crop. Less paperwork, simplifies risk management because you only need to provide number of acres. Production history or evidence of loss is not required because loss payments are based on the county average revenue.